Located on the western coast of Hawai‘i near the village of Captain Cook, Kealakekua Bay is about 30 minutes south of Kailua-Kona. The only access by car is to Nāpō‘opo‘o Beach, along the bay’s eastern shoreline. Take Hwy 11 south from Kailua-Kona to the Nāpō‘opo‘o turn off (about 18 miles), then turn right and proceed 4 miles to the bay. Ka‘awaloa Cove, at the bay’s northern boundary, can be accessed only by boat, and a number of dive tours operate in the area. The MLCD extends from the highwater mark seaward to a line from Cook Point to Manini Beach Point. A line from Cook Point to the north end of Nāpō‘opo‘o Beach divides the district into Subzone A to the north and Subzone B to the south. Kealakekua Bay’s waters are nearly pristine, and its diversity of marine life is spectacular. The northern coastline is bordered by a sheer cliff (Pali-kapu-o-Keoua). On the pali’s face numerous lava tube openings are visible, some of which are ancient Hawaiian burial caves. Captain James Cook, the British explorer who discovered Hawai‘i in 1778, arrived at Kealakekua Bay in January 1779 during his second voyage to the islands. Thought by the natives to be a god, Cook was given royal treatment. But the following month he was killed in a skirmish on the shores of Ka‘awaloa Cove following a series of incidents between his crew and the Hawaiians. In 1878 a 27-foot monument was erected in Cook’s honor by his countrymen near the site where he was killed. On the lava flats behind Cook Monument are the ruins of the ancient village of Ka‘awaloa. Within the bay, the Nāpō‘opo‘o area is generally shallow with little coral, but diving improves as you swim farther out. The area between the Nāpō‘opo‘o landing and the southern tip of Manini Beach Point is the most interesting within this portion of the MLCD. Encrusting coral, caves, crevices and ledges can be found in waters up to about 30 feet deep. On the bay’s northeastern side, the waters below the pali are good for snorkeling during calm water conditions. Abundant coral growth and marine life can be seen in waters of about 5 feet. 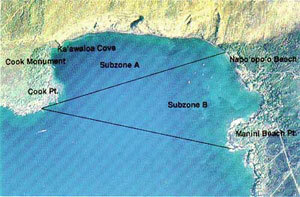 The bay’s best diving is in Ka‘awaloa Cove (near Cook Monument) where depths range from about 5 to 120 feet. The diversity of coral and fish is exceptional, and fish are quite tame. Dolphins are commonly seen inside the bay. Conditions in the bay become dangerous during high surf and southern (kona) storms, but Ka‘awaloa Cove is almost always calm. No lifeguards are on duty at Nāpō‘opo‘o Beach. Restrooms, showers at Nāpō‘opo‘o Beach Park. Within Subzone B only, to fish for, take, or possess any finfish with or by the use of hook-and-line and thrownet, provided that any legal fishing device or method except traps may be used for the taking of akule, ‘ōpelu, and crustaceans. To possess in the water any knife and any shark billy, bang stick, powerhead, or carbon dioxide injector. To fish for, take, or injure marine life (including eggs), except as indicated in “Permitted activities” above. To take or alter any sand, coral, or other geological feature or specimen. Note: anchoring of boats is prohibited in Subzone A. In Subzone B anchors may only be dropped onto sand, or in such a way as to avoid damage to coral.